Volt Casino is the third and most recent online casino to come from Pair Play Bet Ltd, joining Diamond World Casino and VegasPlay Casino. It’s clear from title alone that Volt Casino is a step in a new direction for Fair Play Bet, and that in itself is a good sign, as it’s always nice to find an operator which is willing to do something differently. That being said, however, a willingness to take a risk on something new is not sufficient in itself to ensure the success of a new online casino, nor should it be. At best, Volt Casino being a dose of something new to Fair Play Bet is enough to gain the raise of an eyebrow from all but the most cynical of online casino fans, but it is then on Volt itself to take advantage of that brief moment of attention to blow the minds of those players, and ensure that they categorically believe that there is no other place they could possibly play their favourite online casinos. That’s no easy task, with the sheer number of established casinos dominated the upper echelons of the industry, alongside the plethora of new online casino sites that are popping up on a regular basis, there’s a huge amount of competition, and it’s going to take a lot for Volt Casino to stand out against that. 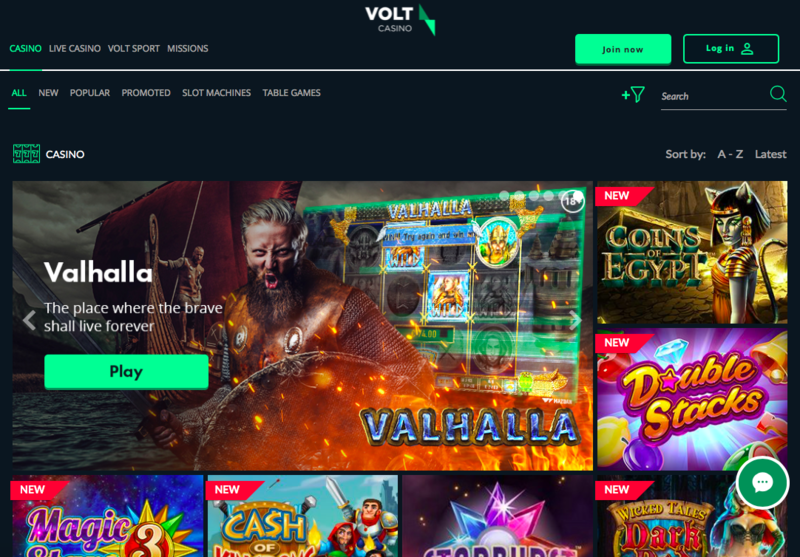 The name Volt Casino may conjure up images of high octane design work, and that’s entirely the right thing to expect, but it does make the actual design of the Volt Casino site something of a surprise. Instead of a world of lightning bolts and batteries like you may expect, you will instead be met by a fairly abstract, almost minimalist design concept, presented in a subtle green and blue colour scheme. The logo involves a stylised volt symbol and the name of the casino in a basic white font, while, short of a digital hand in the banner, there is little else to suggest any level of extreme that may be suggested by the theme. That isn’t to say this isn’t a nice site to look at, but it feels like it may have been too deeply affected by its existence as a sports betting service, because the casino feels more like a sportsbook site, with limited design, and the games thrust into the foreground. While this has worked for certain casinos, Volt Casino is one that it feels like one should expect more from, and it is not given. Talking of things that are expected and not given, at this point, any online casino player has come to assume that any online casino will have a huge array of games from a wide range of software developers, and Volt Casino falls short of providing that. 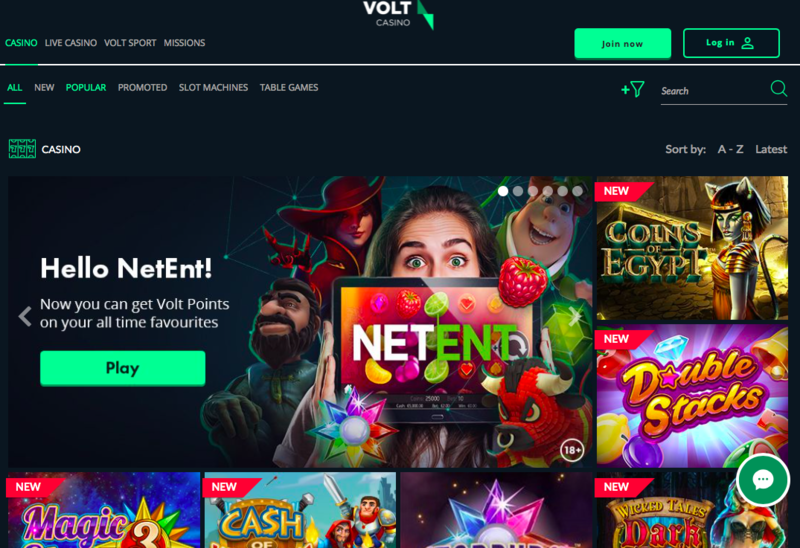 With titles being provided by BF Games, BetConstruct, Fugaso, Microgaming, NetEnt, Play'n GO, Playson, and Wazdan, there’s just not enough on offer here for Volt Casino to come close to battling it out with the giants of the industry. Casino games, live casino options, and sportsbook services, as well as an undertone of gamification throughout the site is impressive, and if there was even close to an acceptable number of places that those things were coming from, the chances are that they would make Volt Casino an excellent choice for players. However, that is not what is accomplished here, instead, Volt Casino feels like nothing more than a mild disappointment from start to finish. This is a site that is brimming with potential, but until it can live up to even a small part of that, there’s no hope for anything above mediocrity.